The 69th Patient at the Cryonics Institute is an 79-year-old female CI Member who had been living in a nursing home. Although she was a Member and the contracts had been executed four months earlier, no funding was in place for her. Under the circumstances, the Member's deanimation caught everyone far more unprepared than should have been the case for a nursing home resident. In this case, part of the problem was that no funding had been arranged and the Member was not funded until the very day of her deanimation. If she had deanimated on a weekend or holiday, funding problems would have resulted in worse care than she received. At 4am on the morning of Friday, August 12, 2005 the Patient- Member completed an asthma treatment. At 6am she was pronounced dead. According to the nursing staff, those in the nursing home are checked every 15 minutes and our patient could not have been deanimated more than 15 minutes prior to the pronouncement. Immediately upon pronouncement the nursing staff phoned the Member's son and packed ice behind her head & neck. The Member's son phoned CI immediately and then drove to the nursing home. Arriving at 6:30pm he packed ice on his mother's face and phoned the funeral director (a man who had handled one of our 2004 patients). The funeral director arrived at 7:30am, removed the patient to his funeral home and packed her completely in ice. No cardiopulmonary support was given. No heparin was given because none was available. The son obtained a cashier's check for $28,000 and arrangements were made to send the $28,000 check to CI with the Patient and the transit permit. The patient arrived at the Detroit airport at around 7pm and surgery began at around 8pm at the funeral home of CI's local funeral director Jim Walsh. Insofar as this was our first American human patient since adoption of our vitrification protocol and insofar as we have not had a human patient to whom we could apply the protocol for nearly a year, we have had lots of time to plan and prepare for this case. The goal of our vitification perfusion protocol is to vitrify the brain. Application of the vitrification mixture to the whole body would result in edema and delay. Because Dr. Pichugin's vitrification protocol ideally involves use of detergent to breach the blood-brain barrier, he wishes to avoid perfusing any region outside of the brain because the detergent causes edema when used elsewhere. Dr. Pichugin wanted Mr. Walsh to perfuse detergent and vitrification mixture through the vertebral & common carotid arteries only, while tying-off the external carotid artery (which perfuses the face, not the brain) so that the face would not be perfused (or edematized). Jim Walsh said that this would be far too difficult to do insofar as the external carotid is often too deep up the jaw to access with ease. Dr. Pichugin was concerned about the edema that could result from perfusing the face, so he decided against using any detergent for our 69th patient. Our goal was to perfuse only the brain, through the vertebral and carotid arteries. For people who have an intact Circle of Willis in the brain, perfusing through the carotids would be sufficient, but for people who do not have an intact Circle of Willis the whole brain cannot be perfused without perfusing through both the vertebrals and carotids. A small but significant percentage of young & healthy people do not have an intact Circle of Willis. About 60% of stroke victims do not have an intact Circle of Willis. Our Patient had atherosclerotic disease and had undoubtedly suffered strokes of some form, if only subclinical. In attempting to perfuse the brain of neuro patients, Alcor in the past has opened the chest (median sternotomy) and perfused through the aorta -- clamping-off the descending aorta and attempting to reduce perfusion to the arms by application of pressure or tourniquets.. Currently Alcor does neuros by cutting-off the head, searching for the vertebrals and then perfusing through the vertebrals and the carotids. When CI vitrified the dog Thor in February, we opened the chest and perfused through the aorta. But we made no attempt to clamp the forelegs, thereby perfusing the upper body. Dr. Pichugin felt that we should perfuse the 69th patient through the aorta as we did with the dog. But Jim Walsh insisted that he could go through the clavicle, ligate the right subclavian and cannulate the vertebral & common carotid on the left. Like Dr. Pichugin, I was dubious about this approach, but Jim is confident of his surgical skills. He assured us that if he could not succeed that he would open the chest and use the aorta. On the right side of the body the vertebral artery comes off the subclavian artery immediately distal to the bifurcation that forms the common carotid and the subclavian. Thus, ligating the subclavian just distal to the vertebral on the right side and cannulating proximal to the bifurcation provides a means of perfusing only into the vertebral and common carotid. The left side of the body is more complicated, however, because the common carotid arises as an independent branch from the aorta and the vertebral arises from the subclavian, which is also an independent branch from the aorta. Jim was able to cut through the clavicle on the right side, ligate the subclavian distal to the vertebral and perfuse the vertebral & common carotid through a single cannula. On the left side Jim used bifurcating cannulas to cannulate the vertebral and common carotid independently. I was very impressed with his surgical skill and I believe this was a world's first for cryonics. Perfusion began at 8:30 pm. Sarah Walsh (Jim's daughter, who is also a licensed funeral director), Andy Zawacki, Dr. Pichugin and I rendered assistance. Considering that no heparin had been administered, it appeared that we were not having much problem with clotting. But then flow stopped in the left vertebral and a burst of blood came from the left jugular. We gave-up on attempting to perfuse through the left vertebral. Jim expressed the opinion that clotting caused this problem, although none of us really know what happened. 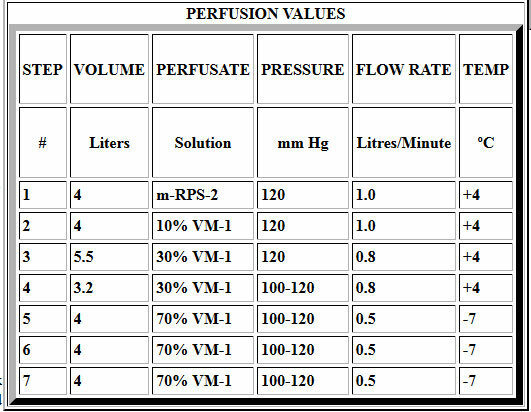 The washout solution was m-RPS-2, Dr. Pichugin's modified Renal Perfusion Solution. VM-1 is Dr. Pichugin's vitrification mixture. Between steps 3 and 4 two burr holes were drilled in the patient's skull, one on the left hemisphere and one on the right hemisphere. Because the brain shrinks away from the skull when perfused with vitrification mixture, there is no danger of injuring the brain with a burr hole. A refractometer was used to measure the refractive index of the fluids in the burr holes and in the effluent until they all matched the refractive index of VM-1. This occurred at the end of Step 7, at which time perfusion was ended after only one-and-three-quarter hours -- a surprisingly short perfusion time. The woman was much smaller than Dr. Pichugin had been expecting, so he had made-up more perfusate than was needed. The patient was returned to the Ziegler shipping box in which she had arrived, dry ice was packed around her head and she was driven to the CI Facility where she was transferred to our new large cooling box. We were in the process of preparing the new cooling boxes and the associated software for use with human & animal patients. The software was still not working properly and had only been tested with the small cooling box. But we knew the system was functional enough to use and would certainly be better than our previous manual methods. The Patient was placed on a board on a cot in the large cooling box with her head close to the fan. Between the board and the patient was an open sleeping bag which would be wrapped around her when the cooling was complete. Three thermocouples were placed in the patient, one below the skin on her head, one deep in her nose (to measure brain temperature) and one deep in her chest. The thermocouple in the skin on her head was used as the controlling temperature to determine how often the liquid nitrogen gas valve would open to give a controlled rate of cooling. The fan undoubtedly speeded cooling of the patient's head by blowing away the heat, while keeping the temperature in the cooling box more uniform. The entire cooling lasted 105 hours. An examination of the cooling curve for the first 20 hours shows how much more rapidly the head cooled compared to the rest of the body. After the first day the 3 temperatures were mostly maintained within a band of 3ºC. The small spikes in the red curve correspond to the interruptions due to changing of liquid nitrogen tanks. We used about 13 of our 180 liter tanks, or about 2340 liters. The tanks used in the initial cooling consumed a lot of liquid nitrogen very quickly, as did the last tanks used to maintain the cooling box at the lowest temperatures. In the future we plan to have the cooling box connected directly to our 3,000 gallon bulk tank, which will save us a great deal of hassle and will eliminate the temperature spikes. We were only able to reach a minimum temperature of -192ºC in the cooling box, and that temperature was reached at about 4am on Wednesday morning. We had to maintain that temperature until 9am when we were able to get access to the forklift. With experience and better control of the software we should be able to plan better in the future. When Andy and I removed the patient from the cooling box, the sleeping bag was soaked with liquid nitrogen and there was about two inches of liquid nitrogen in the bottom of the box. By Andy's watch, it took 13 minutes from the time the patient was removed from the cooling box to the time when she was placed in liquid nitrogen. With speed & efficiency Andy closed the sleeping bag, tied the bag & patient to the board and delivered the bundle to the cryostat. I have little in the way of personal details about the Patient other than the fact that she had been a CI Member for about 4 months and apparently has a devoted son. Concerning the perfusion process, I know that some of our Members are not happy with the fact that our vitrification protocol focuses so much on the brain. But we do preserve the whole body and we do believe that future molecular and biotechnological repair should be easier for bodies than for brains, so we concentrate on the brain. As we become more proficient with our protocol I do hope to be able to perfuse the body as well, if we can be certain that preservation of the brain will not be compromised.